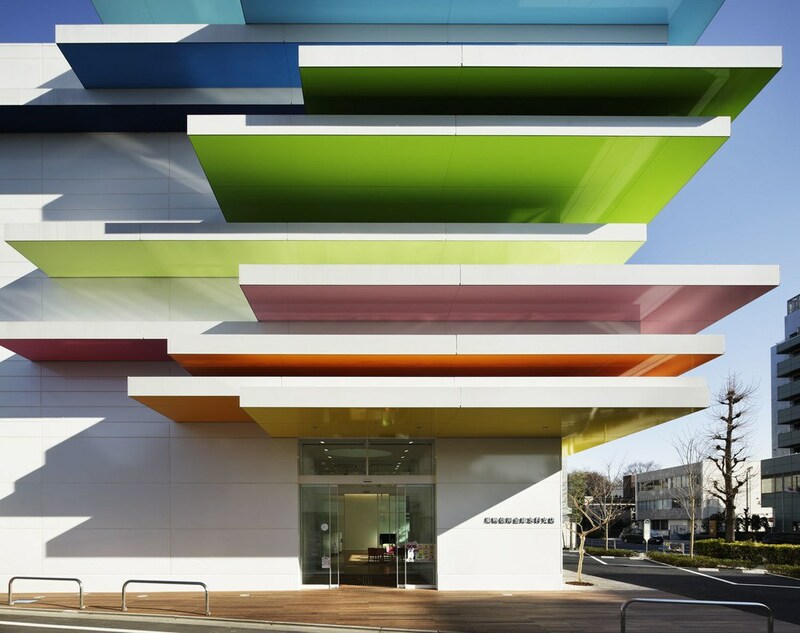 We were trawling the archives this week and found ourselves drooling over the beautiful, bright, unconventional Sugamo Shinkin Bank designed by Emmanuelle Moureaux Architecture & Design in Tokyo, 2011; an inspirational bank branch concept, dominated by bold explosions of colour. The architecture instantly draws your attention, featuring multi-coloured, protruding horizontal layers which brightly illuminate at night. Inside the branch, customers instantly feel a sense of relaxation with three long glass air wells providing sunlight throughout. Colour is used sparingly throughout the interior; a subtle accent to the largely white finishes and materials. The concept, Rainbow mille-feuille, is daring, playful, unconventional and brilliantly executed, a credit to Emmanuelle Moureaux Architecture & Design. In the competitive and somewhat conventional world of Banking, it’s so refreshing to see a concept that breaks down the barriers, a concept that despite being implemented six years ago, is still so ahead of the curve. Early in November, we wrote a blog post about the resurgence of colour (you can read it here) and how arguably in a time of continued political and social dissent, we can find a collective comfort in the playful innocence of bold, bright colours and hues. Be it bold prints and patterns displayed on public buildings, or an increase in colourful street art, we’re loving the spread of colour love and look forward to watching the trend grow.